I've been spending a lot of time perusing Pinterest looking for pins for my Red, White, and Blue board. I'm slightly obsessed with all things red, white and blue at the moment. We'll blame it on summer. 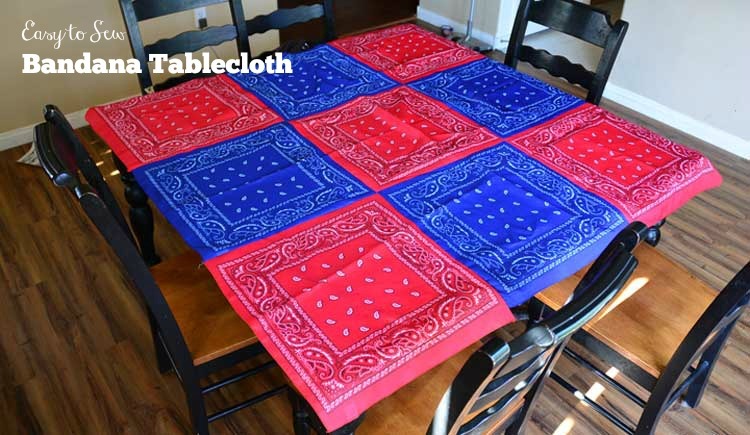 In my Pinterest wanderings, I came across a really cute red, white, and blue tablecloth made up of bandanas. I loved it! But I could not for the life of me find the original source of this pin. So I decided to just whip one up myself. 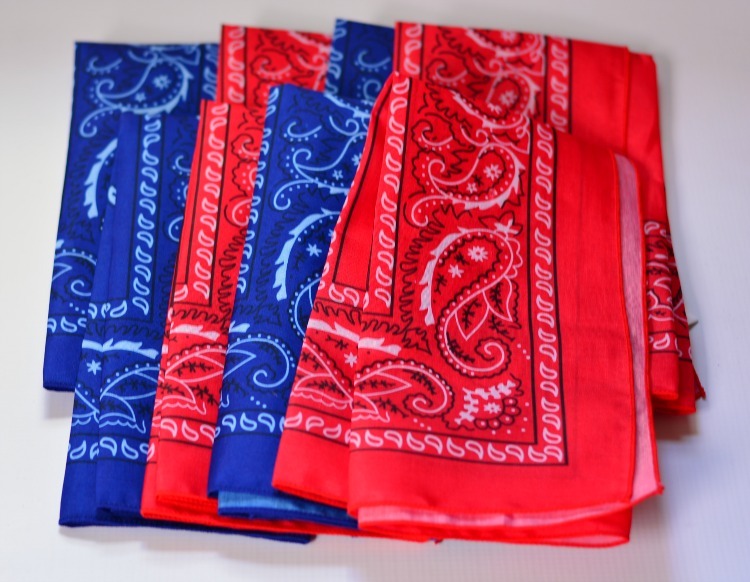 While at the dollar store one day, I noticed they had blue and red bandanas in a 2 pack for $1 – obviously. Hey! I figured I could whip up my bandana tablecloth for about $3-$4. However the dollar store only had red and blue but I found lots of fun colors on Amazon! I have a 70″ square table, which I love, but it is impossible to find a reasonably priced tablecloth for this table! I figured it was a bonus that I could just make one myself for so cheap. I ended up needing 9 bandannas total. I started by laying out the bandanas on my table in a pattern I liked to make sure it fit. I didn't want it to drape too much because I was hoping for something really casual and easy. 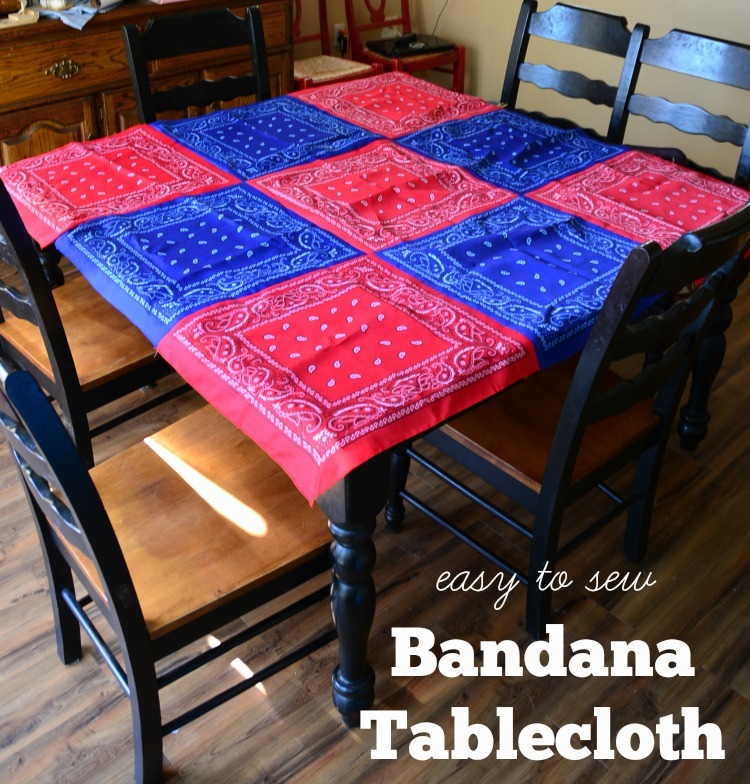 I ironed each bandana to get the folds out and laid them down on the table. 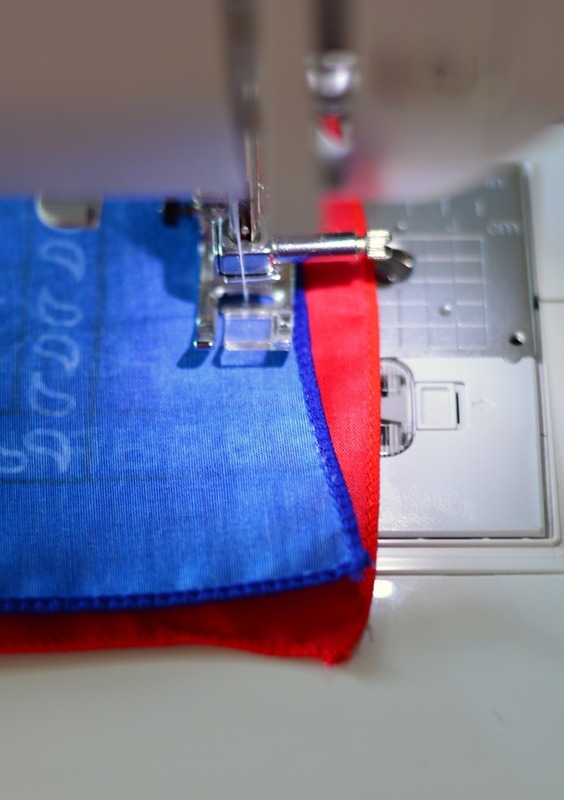 Then I sewed three strips of three bandanas together and attached those strips together to form a square. But here's the problem – there is a reason dollar store bandanas are cheap. They weren't exactly perfectly square. I ended up with some very interesting seams! The tablecloth gathers or puckers a tad where things didn't match up – but I still love it! If you want better seams, and a flatter tablecloth, I would suggest either buying nicer bandanas or squaring off the dollar store version! These bandanas on Amazon are 100% cotton – I'd wash first, then sew.